Princess Sophie of Saxe-Weimar-Eisenach was the "first royal woman to be incinerated," according to a headline in the New York Times on September 20, 1913. 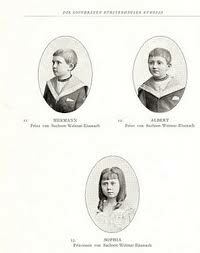 Sophie was the youngest of three children -- and only daughter -- of Prince Wilhelm of Saxe-Weimar-Eisenach and Princess Gerda of Isenburg-Büdingen. She was born at Düsseldorf in 1888 and died at Heidelberg on September 9, 1913. She took her own life because her father would not allow her to marry the man she loved. At the time of her death, she was 25 years old, "a great beauty, and much admired in Court society for her charming ways." She had retired to her room, "apparently in her usual spirits." Not long after midnight, a shot was heard coming from her room. She was found dead. Sophie had shot herself through the forehead. Princess Sophie had been despondent for some time because she could not obtain consent for her marriage with Baron Hans Viktor von Bleichroeder, the son of wealthy banker. Earlier in the year there were reports of an engagement, but these reports were hastily denied by the Saxe-Weimar court. It was said that the Grand Duke -- Wilhelm Ernst -- would give approval to the marriage, but Sophie would have to relinquish her title. She would not agree to this. Her father appeared more willingly to allow the marriage -- he had worked as a waiter in New York City, using the name William Rohde -- but when the Grand Duke threatened to cut off his allowance, Prince Wilhelm had to tell his daughter that there could be no marriage. The von Bleichroeders were Jewish, which was another reason for the family's displeasure. But was the doomed love affair the reason for Sophie's suicide? One month earlier, Sophie, accompanied by Baron von Bleichroeder and her mother, Princess Gerda, checked into the Hotel Savoy in Fontainebleau. During their time in France, the three young people would take long drives in the country. One night, while driving at a high speed, they hit a little peasant girl, who was seriously injured. The next day, Baron von Bleichroeder, visited the little girl's parents, and paid them $3000 in compensation. The little girl did not survive. The chauffeur was originally charged with running over the girl, but the true facts came out in the trial that Princess Sophie was behind the wheel at the time of the accident. The chauffeur was acquitted. The accident occurred on August 10th, and rumors were already circulating throughout Weimar that Sophie had been responsible for the little girl's death. Perhaps, because she could not face the scandal that would have ensued, the princess decided to take her own life. A week after Sophie's death, a German newspaper reported that the German baron was not the man she loved, but that her life "was embittered by the tragedy of a hopeless love' for Lieut. Hans Edlar von Putlitz. But because they both knew that a marriage would be out of the question, the couple separated. Edlar von Putlitz rejoined his regiment and was sent to Athens where he died in 1908. The official cause of death was appendicitis, but the paper reported that the death was actually a suicide. According to this report, Queen Sophie of Greece (nee Princess of Prussia) followed the coffin, which "showed that she highly honored the young attaché, but she also knew and sympathized with his incurable passion." Although her family maintained that Sophie died of a "disease of the heart," it was difficult to deny the rumors that were flying around Heidelberg that Sophie had taken her own life. Von Bleichroeder was not permitted to attend her funeral. On August 1, 1915, the young Baron was killed in action on the Warsaw front. There was tragedy all around. Sophie's eldest brother, Hermann, lost his titles and dynastic rights in 1909 when he married Wanda Paola Lottero. He was created Count of Ostheim. Sophie's other brother, Albert, was killed in action in France in 1918. Several days after Sophie's tragic death, her father released a statement to the media: "Baron Hans von Bleichroeder, like all acquaintances of the House of Saxe-Weimar, had a farewell view of the departed, but he was expressly forbidden to take part in the funeral or to attend the cremation. 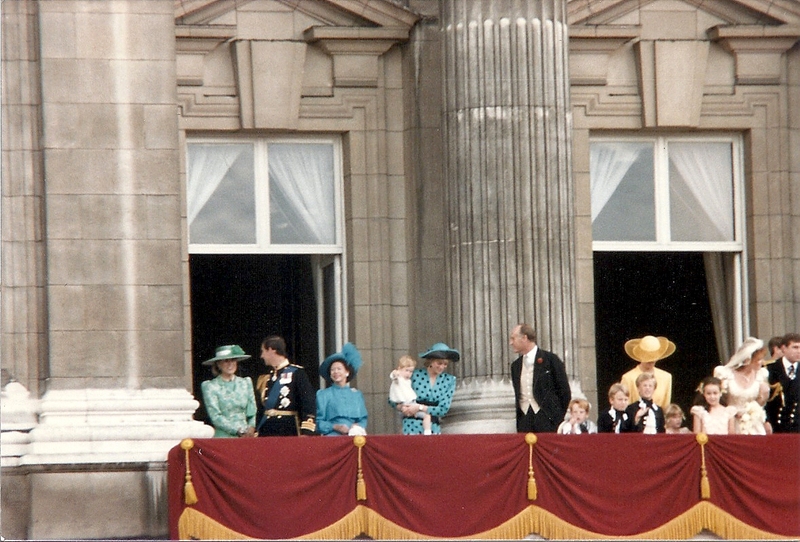 As for the stories set in circulation in regards to a marriage between Princess Sophie and Baron von Bleichroeder, there needs to be repeated the oft-spoken statement of her father, that all the money in the world would never have sufficed to bridge the gulf between a Princess of Saxe-Weimar and Baron von Bleichroeder." The photo accompanying this post comes from the book, Die Souveränen Fürstenhäuser Europas. This book, which was published in 2 volumes in 1898-1899, featured photographs of every member of all of the reigning royal houses in Europe. The book was prepared by F.U. Graf von Wangel. Very sad story. It's always interesting to learn about some not very well-known royal person. Thanks. can you post a photo with sophie,please ? Nice little lady,thank you very much ! You are very welcome. It was the only one I had. thank you for your information. The information in the article is based on original reporting in the New York Times and other newspapers, which described the family as baronial. Having a dr jur is irrelevant to the story, but thanks for the update. Can you post a photo of Johannes Bleichroeder? I find this story heartbreaking! The remains of Alexei may be put on view! And they call the Horse "Sneezy"
The cats want to say Hi!